Garlic, Allium sativum, is an herb, which was originally grown in Central Asia. It goes by many names, including “Nectar of the Gods’ and “Stinking Rose”. Historically, Garlic has been used as a spice. However, Garlic has many medical applications as well, which are derived from the plant’s bulb. 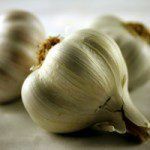 Garlic can be used to prevent Heart and Vascular Disease, Cancer, Colds, Skin Infections, and Tick Bites. It has been demonstrated that Garlic lowers Blood Pressure in individuals with Hypertension (HTN) by 7%-8% (UMMC). Also, it has been shown that Garlic has the potential to lower Blood Pressure in individuals without HTN (WebMD). Garlic lowers Blood Pressure by causing blood vessel dilation, which decreases vascular resistance (Pedraza-Chaverri). Garlic may also slow down and prevent Atherosclerosis. Atherosclerosis, occurs when Cholesterol and Fats accumulate leading to hard plaques growing on our artery walls. Atherosclerosis can result in Heart Attacks, Strokes, and Pulmonary Emboli, Also, Atherosclerotic plaques weaken artery walls, resulting in Aneurysms (A.D.A.M. Medical Encyclopedia). The UMMC cites a study conducted in which Garlic slowed down the progression of Atherosclerosis. While, more research still needs to be done, Atherosclerosis prevention may be due to Garlic’s ability to lower cholesterol, triglycerides, and lipids, and its anticoagulant activity (UMMC). Garlic may also help to prevent Cancer. Studies have shown, Garlic consumption reduces the risk of Colon, Rectal, Stomach, Laryngeal, Esophageal, Ovarian, and Renal Cancer. Garlic Supplements have not to be as effective. Researchers who reviewed several studies determined, consuming Garlic decreases your risk Colon and Rectal Cancer by 30% (Ngo, Williams, Cobiac, and Head). Garlic may prevent Cancer due to it being rich in antioxidants, and its ability to increase immune responses (UMMC). While Garlic may enhance the immune system to reduce cancer risks, it might also do the same to prevent colds. Research has demonstrated, individuals who consumed garlic had fewer colds, and when people who had garlic did get a cold their symptoms subsided faster (Josling). Garlic can also be used to treat skin infections. Studies have shown that Garlic gel has Anti-Fungal Activity against Ringworm, Jock Itch, and Athletes Foot. Garlic’s Anti-Fungal activity is due in large part to one of its compounds, Ajoene (WebMD). Lyme Disease, which is transmitted by ticks, is very prevalent in the Northeast. Research suggests that individuals who consumed garlic are less likely to be bitten by ticks (WebMD). Side Effects reported with Garlic use include upset stomach, diarrhea, bloating, bad breath, body odor, headache, fatigue, loss of appetite, muscle aches, dizziness, sweating, low blood sugar, allergic reactions. Garlic is contraindicated in people with bleeding disorders, undergoing surgery, or taking anticoagulant medications as it might increase the risk of bleeding. Ehrlich, Steven. “Garlic.” University of Maryland Medical Center. N.p., 26 Jan 2011. Web. 25 Jun 2012. Galeone C, Pelucchi C, Levi F, et al. Onion and garlic use and human cancer. Am J Clin Nutr 2006;84: 1027-32. “Garlic.” Memorial Sloan-Kettering Cancer Center. N.p., 18 Jun 2012. Web. 25 Jun 2012. “Garlic.” WebMD. N.p., n.d. Web. 25 Jun 2012. Josling P. Preventing the common cold with a garlic supplement: a double blind, placebo-controlled survey. Adv Ther. 2001;18(4):189-193. “Hardening of the arteries.” A.D.A.M. Medical Encyclopedia. N.p., 20 May 2011. Web. 25 Jun 2012. Pedraza-Chaverri J, et al. Garlic prevents hypertension induced by chronic inhibition of nitric oxide synthesis. Life Sci 1998;62:71-7.